A random Coachella discovery back in April was my first introduction to Yelle, setting my heart racing and hips shaking in the sweltering Gobi tent within seconds. Nearby, a man was dancing in a fit of the most ecstatic happiness I’d ever seen while a circle of friends cheered & watched his (clearly chemical-assisted) euphoria unfold to the sounds of Yelle‘s gorgeously bright, French electro-pop. It was one of those pure musical moments the movies never get quite right, the kind of high most music addicts spend their lives chasing. I was instantly a fan. Fans adore them. 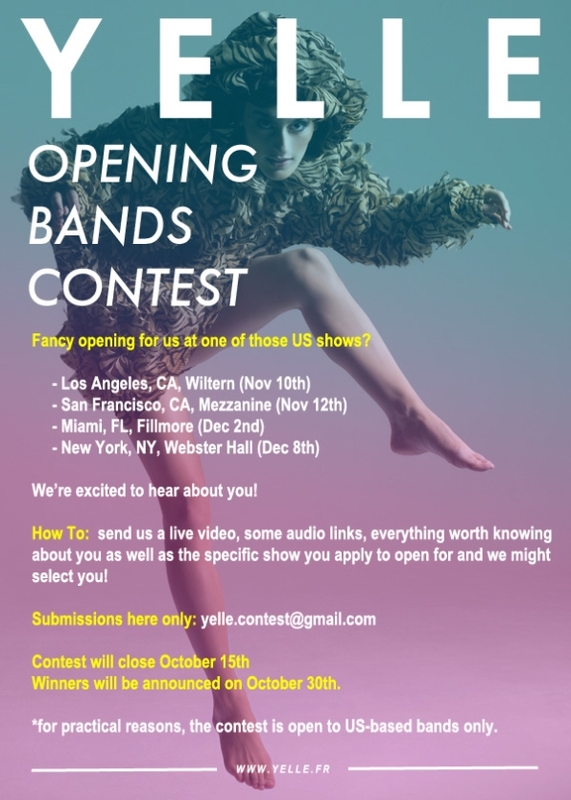 Bands would kill to open for them – and if you’re musically inclined, we’ve got some great news for you: Yelle is launching a contest to find an opening act for each of their upcoming shows in Los Angeles, San Francisco, Miami, and New York. If you think you have what it takes to share the stage with Yelle, send some music and info about yourself to yelle.contest@gmail.com. Yelle have also released a trailer for the upcoming worldwide Safari Disco Tour – check it out!